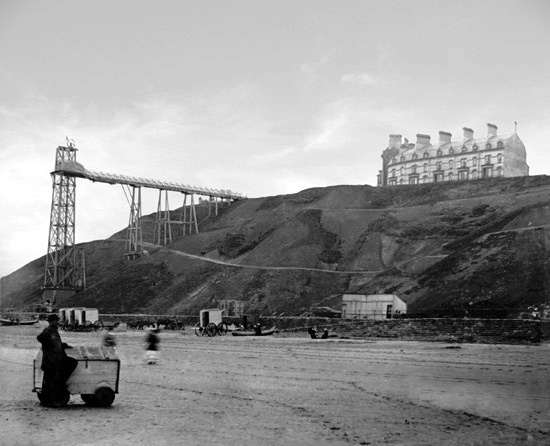 Before its well known cliff lift, Saltburn had a cliff hoist between 1870 and 1883. The wooden structure built by John Anderson of the Saltburn Improvement Company dropped people 120 feet to the pier level and must have been a pretty intimidating journey. The new plaque to mark the location was unveiled by Councillor Vera Rider on Thursday July 28 2011. This entry was posted in Saltburn, Signs and Markers, Too Late by chris.twigg. Bookmark the permalink. Yes, I agree with Phil. I didn’t know that the ‘hoist’ had existed, but I’ve always thought the lift was very clever engineering, using water. Britain had some very clever engineers and bridge designers… It’s a pity we don’t STILL have them!